• All tracks available exclusively on this CD. White Star Cluster and Theater of Operations are sound environments that echo current events in Iraq--sonic reenactments exploring perceptions of war. Both projects are based on spoken texts transcribed from videos of U.S. soldiers in Iraq. White Star Cluster focuses specifically on footage captured in Ramadi on December 4, 2006, in which American soldiers come under friendly fire attack. These dialogues were then performed in the studio by a cast of players. From quiet, intimate voices to aggressive and confrontational language and sounds, the recordings span a range of human emotions as the soldiers' reenacted dialogue reflects a sobering and at times discomforting truth. The pieces also include a repeated score based on Erik Satie's Vexations. Satie wrote a number of compositions intended to be presented not onstage, but in the lobby of a concert hall; not during the performance, but rather at intermission. A similar strategy is adopted here by shifting attention away from the actual videos to the invisible sound content. In this layout, we absorb more readily the artificial rendering of war, while allowing the hidden reality of it to unfold elsewhere, unacknowledged. What do we really know and understand about this historical event? How do we see our own personal involvement in it? What is the role of physical distance in defining our relationship to the war? What is the role of mass media--both the one-way media such as television and two-way character of the Internet--in shaping our emotional response to the ongoing war? 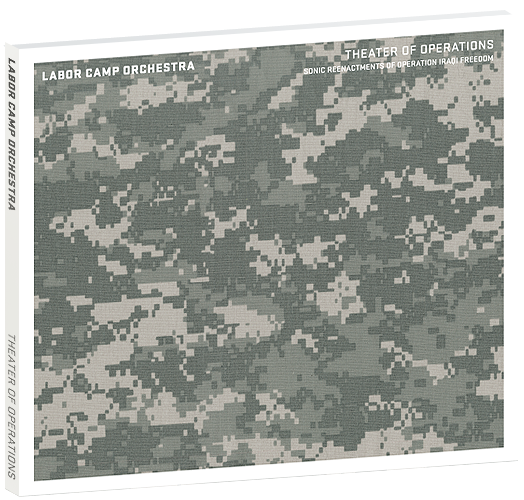 All instruments and voices by Labor Camp Orchestra, with the following additions: Soprano: Lori Lewis; Double Bass: Sara Thompson; Violin: Ava Szychalski; Lead Voices: Rebecca Alm, Scott Bowman, Emmet Byrne, David Goldes, Oliver Grudem, Justin Heideman, Joan Johnson, Pamela Johnson, Kristin Makholm, Abinadi Meza, Aydin Mohseni, Rosie Szychalski, Piotr Szyhalski, Osla Thomason, Paul Wenzel; Additional Voices: Michael Aberman, Jacey Braband, Rebecca Burg, Allegra Denton, Brian (Buddy) Domeier, Daniel Ferro, Ethan Holbrook, Adam Hutchinson, James Kleiner, Heather Kraft, Joshua Nelson, Amalia Nicholson, Alexandra Roche, Andrew Schatz, Alex Schroeter, Tyler Stefanich, Karl Zinsmaster; All texts are based on the transcripts from videos shot in Iraq. Transcription: Rosie Szychalski; Musical score based on Vexations by Eric Satie. All tracks written, performed and produced by Piotr Szyhalski. This is a beautifully produced high quality CD pressed from a glass master. Mastered at Magneto Mastering, Minneapolis. Design and Photography: Labor Camp. Generous support from the Minneapolis College of Art + Design and the LABoral Centro de Arte y Creacion Industrial is gratefully acknowledged. 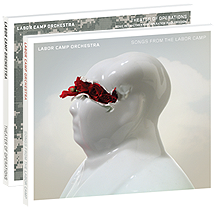 Labor Camp Product © 2009-2010 Labor Camp Orchestra.